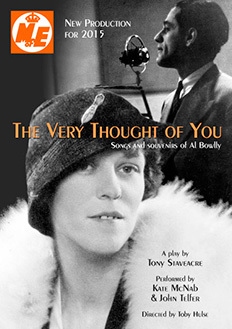 In this new musical play by West country author Tony Staveacre, Al’s second wife conjures up memories of the legendary crooner through the songs he made famous – songs which are still selling today on CD, although Al was killed in an air-raid in 1941. From the sweetshop in Bournemouth where she ended up after the war, Marji recalls a hectic musical journey that links Raffles Hotel, Berlin in the Depression, the Rainbow Room in New York, the Grand Canyon, the Kursaal at Scheveningen in Holland, the night-clubs of the West End and the variety theatres of the North. This is a play about a singer, played by a singer, Kate McNab. The songs tell the story, and recall a time when dance music was played over the radio, while at home listeners rolled up the carpet and asked their friends in, and pretended they were on the dance floor of the Café de Paris in white tie and tails. Class and aspiration, high society and snobbery: ‘The Girl who Danced with the Man who Danced with a Girl who Danced with the Prince of Wales’. Fame and fantasy: the joy of music, a holiday without strings: sentimentality and sexuality, the sweet and the sour. They went out to see a show.